New Senate Campaign Ad For Mo Brooks Features Baseball Practice Shooting : The Two-Way "This makes my stomach turn," said an aide to Rep. Steve Scalise of a fellow Republican's ad. The video opens with sound from last month's shooting that left Scalise seriously injured. 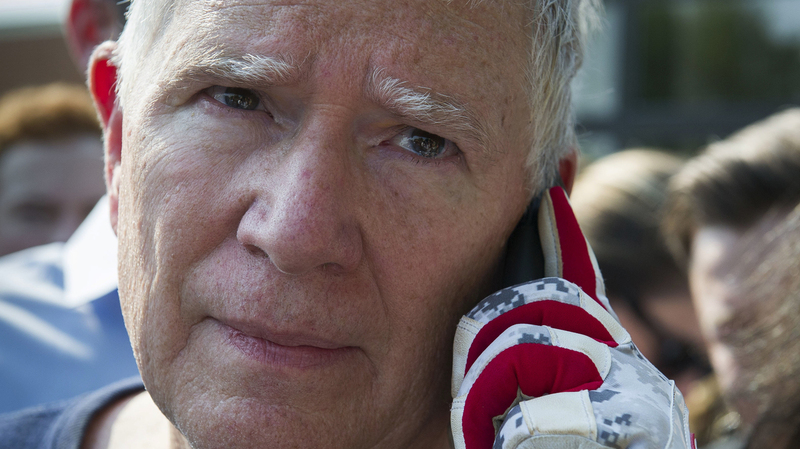 Rep. Mo Brooks with reporters in Alexandria, Va., following the June 14 shooting by a rifle-wielding gunman at a congressional baseball practice. A new Senate campaign ad for Rep. Mo Brooks uses audio from last month's shooting at a congressional baseball practice that left Rep. Steve Scalise, R-La., gravely wounded. Brooks was among the congressmen practicing at the Alexandria, Va., baseball diamond and highlights the experience as he competes in the GOP Senate primary in Alabama, a traditionally conservative state. The ad opens with sounds of gunshots being fired and shouts of, "Stay down!" The accompanying text says, "June 14: A Bernie Sanders supporter fires on Republican Congressmen." The video goes on to show a journalist asking Brooks just after the shooting whether his views have been changed "on the gun situation in America." "The Second Amendment right to bear arms is to help ensure that we always have a republic," Brooks says. "So no, I'm not changing my position on any of the rights that we enjoy as Americans." The ad closes with, "I'm Mo Brooks, candidate for the Senate, and I approve this message." After James Hodgkinson shot four people at the baseball practice including a lobbyist, a congressional aide and a U.S. Capitol Police special agent, Brooks tried to staunch the bleeding of Scalise, the most seriously wounded. Hodgkinson, who had volunteered on the Sanders campaign for president, was killed in a gun battle with police. "I'm not changing my position on the Second Amendment despite being targeted for assassination by a liberal," Brooks tweeted Monday. Brett Horton, Scalise's chief of staff tweeted that the ad made his "stomach turn." Brooks told Politico "I understand completely. It makes my stomach turn too. It reminds (me) of a moment in my life I hope I never have to repeat." But Brooks maintained that the ad does "absolutely not" leverage the shooting. There are several Republican hopefuls running in Alabama's Senate primary, but AL.com reports that the race has likely come down to three candidates; former Alabama Chief Justice Roy Moore, followed by Brooks and Sen. Luther Strange. Strange was appointed to the seat in February after Jeff Sessions vacated it to become attorney general, but he must win a special election to finish out the term. The National Rifle Association has endorsed Strange. The primary takes place Aug. 15 and the special election is scheduled for Dec. 12.